The sun was out all day - unfortunately the wind didn't pick up as we were hoping for. After the second round of the registration the sun came out and athletes and spectators were able to enjoy the great view around Reschen. Unfortunately the wind didn't show up so that today it was all about relaxing, preparing gear and discussing strategies for the final day of the event. Skippersmeeting will be tomorrow at 10:00 am with a first possible start at 10.30 am. 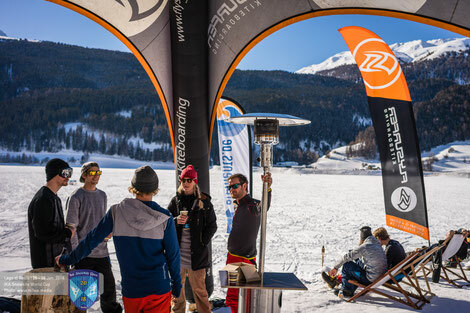 Tonight we will enjoy a few drinks at the Disco Bergstadl, where the official After Show Party start at 10:00 pm. Take the chance to see the world's best snowkiter tomorrow for intense races and freestyle action.